If you don’t have the luxury of visiting the new Globe Theatre in London, writes Open Culture, taking a tour, or seeing a performance lovingly-recreated with all of the costuming (and even pronunciation) from Jacobean England, you can get the flavour of this wondrous achievement through an app for iPhone and iPad users. The Globe began its life in 1599, in a story that ‘might be worthy,’ writes the Shakespeare Resource Center, ‘of a Shakespearean play of its own.’ Built from the timbers of the city’s first permanent theater, the Burbage, which opened in 1576, the Globe burned down in 1613 “when a cannon shot during a performance of Henry VIII ignited the thatched roof in the gallery.” Within the year, it was rebuilt on the same foundations (with a tiled roof) and operated until the Puritans shut it down in 1642, demolishing the famed open-air theater two years later. In a twist to this so far very English tale, it took the tireless efforts of an expatriate American, actor-director Sam Wanamaker, to bring the Globe back to London. After more than two decades of advocacy, Wanamaker’s Globe Playhouse Trust succeeded in recreating the Globe, just a short distance from the original location. Opening in 1997, three-hundred and fifty-five years after the first Globe closed, the new Globe Theatre recreated all of the original’s architectural elements. The stage projects into the circular courtyard, designed for standing spectators and surrounded by three tiers of seats. While the stage itself has an elaborate painted roof, and the seating is protected from the weather by the only thatched roof in London since the 1666 Great Fire, the theatre’s courtyard is open to the sky. However, where the original Globe held about 2,000 standing and 1,000 seated playgoers, the recreation, notes TimeOut London, holds only about half that number. 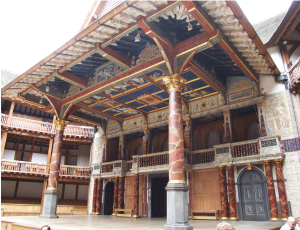 Still, theater-goers can ‘get a rich feel for what it was like to be a ‘groundling’ (the standing rabble at the front of the stage) in the circular, open-air theatre.’ Short of that, we can tour the Globe in the virtual recreation at the top of the post. Move around in any direction and look up at the sky. As you do, click on the tiny circles to reveal facts such as ‘Probably the first Shakespeare play to be performed at the Globe was Julius Caesar, in 1599,’ and videos like Mark Antony’s famous ‘friends, Romans, countrymen’ speech, performed at the Globe, above. If you don’t have the luxury of visiting the new Globe, taking a tour, or seeing a performance lovingly-recreated with all of the costuming (and even pronunciation) from Jacobean England, you can get the flavor of this wondrous achievement in bringing cultural history into the present with the virtual tour, also available as an app for iPhone and iPad users. This interactive tour supersedes a previous version we featured a few years back.